Thanks to Keep Copiah County Beautiful – Nora Berch and Kim Palmer for one fantastic State GAC Event. Neeley and I were overwhelmed with the number of volunteers that participated. I look forward to visiting Lake Hazel soon. Many thanks to the KMB Board members for their support and to the board members that attended and also to the Affiliates that came and volunteered that day as well. 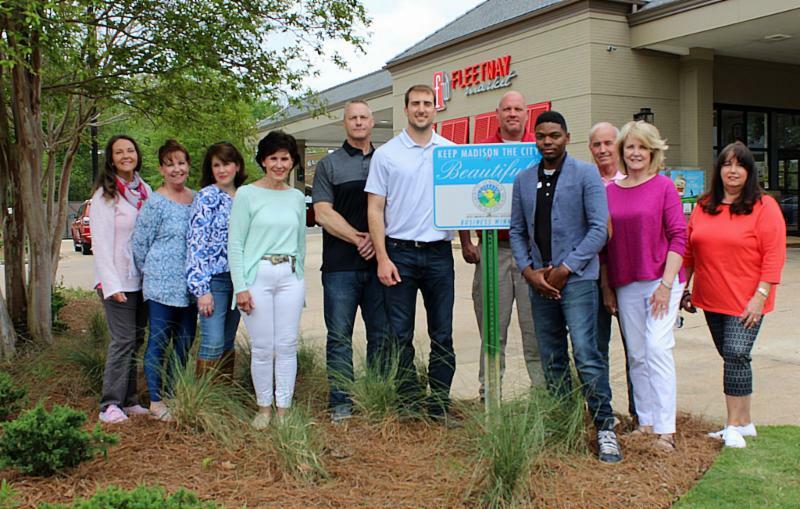 This was an example of our Keep Mississippi Beautiful family joining forces once again. I hope you have noticed the wildflowers blooming and pollination at its best during your travels this summer. 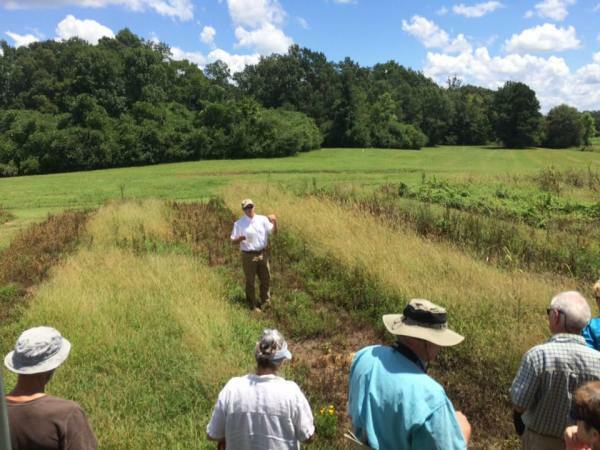 On this note, I hope to see everyone June 21 st at our third Wildflower Field Day, being held in Newton at the MSU Extension/Coastal Plains Extension Center. You will have the opportunity to hear the wonderful presentation on landscaping with native ornamentals. Have a wonderful summer and if you are traveling – continue to look for our new outdoor billboards: “CAN IT” with Dak Prescott and remember: Help us Keep Mississippi Clean and Green and recycle all you can! KMB Executive Director Sarah Kountouris at our GAC Kickoff event at Lake Hazel. 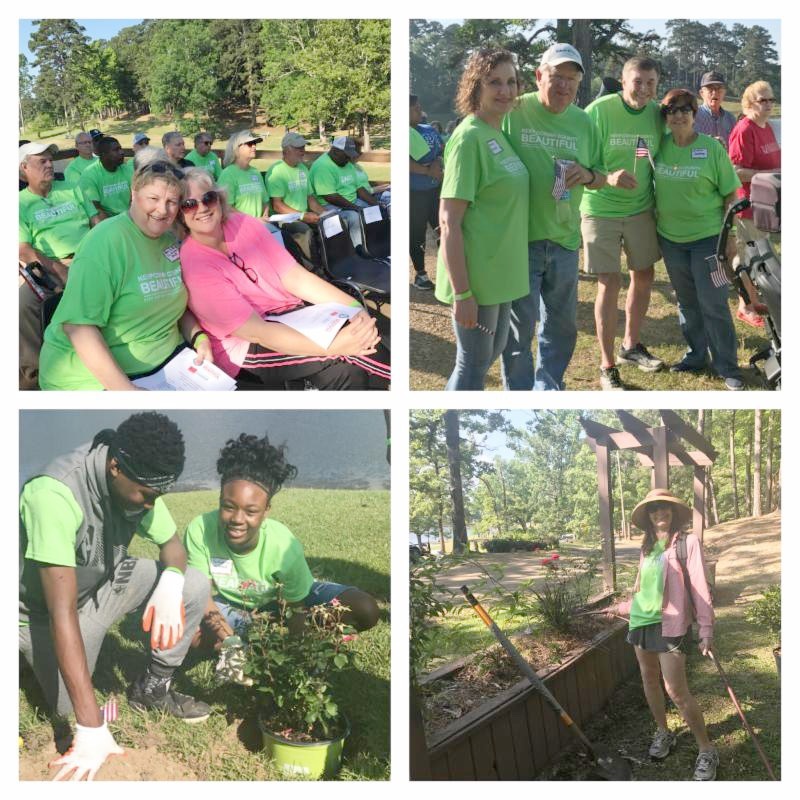 On Saturday, May 19, KMB partnered with Keep Copiah County Beautiful for our 2018 Great American Cleanup State Wide Kick-off event at Lake Hazle in Hazlehurst, MS.
With over 280 volunteers, we planted over 300 plants, defined the walking trail, leveled existing picnic tables, added a brick entrance, and picked up over 50 pounds of litter. 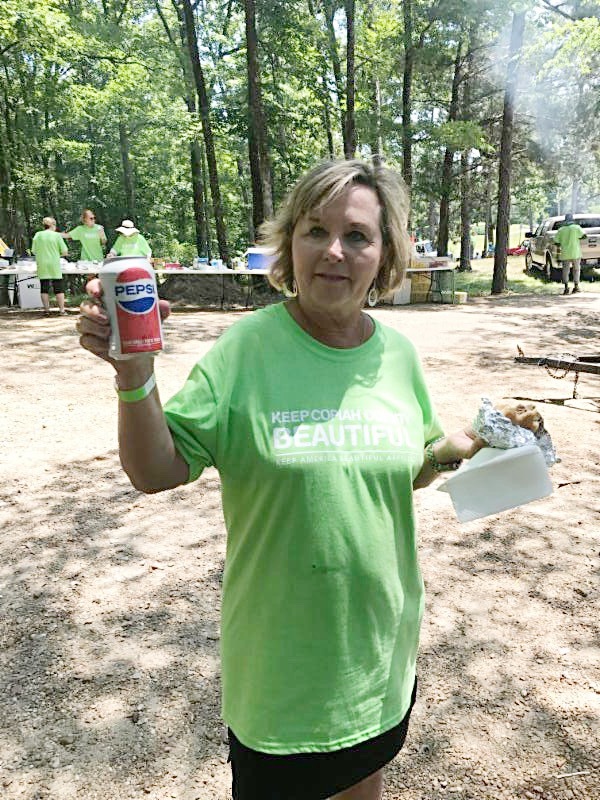 Congratulations to Keep Copiah County Beautiful Co-Directors, Nora Berch and Kim Palmer for such a successful event and thanks to Bill Russell and the NRCS cooking team for a delicious meal for the volunteers! Please make sure you're reporting your 2018 Great American Cleanup events within your dashboard ! Keeping track of your events and the progress you and your volunteers make is crucial in helping to capture all the hard work and dedication at each GAC event. Communities across the nation have come together in an effort to improve the quality of life in the neighborhoods where we live, work and play. Show off all that you've accomplished by reporting the results. The data collected can also benefit the organization as a whole by highlighting how impactful the GAC program is -- this can lead to more fundraising, partnerships and sponsorship opportunities. It also solidifies the KAB mission. Thank you to the affiliates who have done a great job in reporting their GAC events as well as sharing photos and information on your incredible GAC initiatives. We are so proud and inspired by you all! 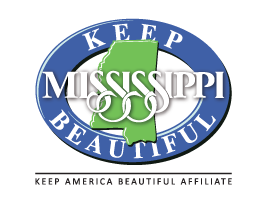 Don't delay getting your Annual Affiliation Fee paid and Annual Reporting submitted by August 1 to receive the 2018 Keep America Beautiful President Circle Award to be eligible for grants and 2018 Keep MS Beautiful's Circle of Excellence Award! Interested in participating in the Wildflower Trails of Mississippi? Join us for a field day where we will discuss native ornamentals & landscaping and the a field tour of test plots. Lunch will be provided. Please RSVP by June 8. 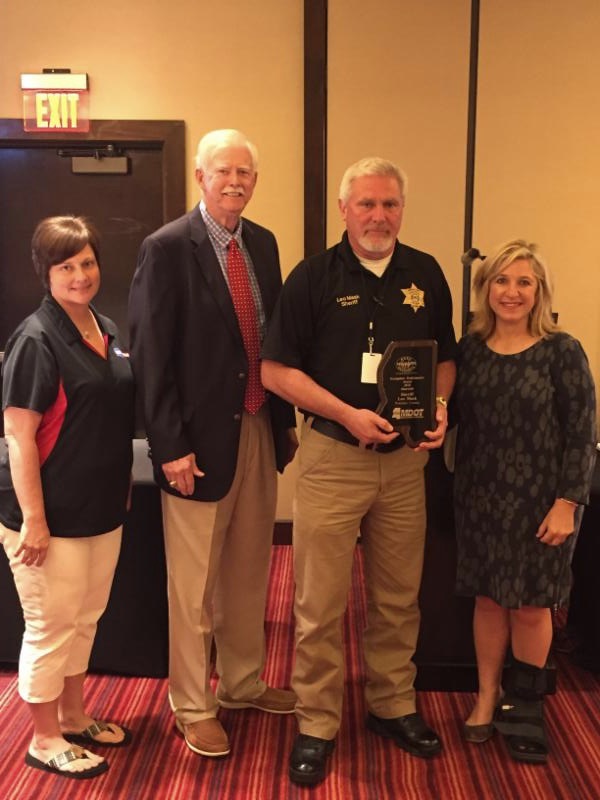 Keep Mississippi Beautiful is proud to present Pontotoc County Sheriff Leo Mask an Appreciation Award for collecting the most bags of litter this past year. Sheriff Mask collected 7,177 bags of litter on our state highways. This year over 53,000 bags were collected by inmates in 18 counties across the state. Pictured is MDOT District 1 Anti-Litter Coordinator Michelle Williams, MDOT Southern Commissioner Tom King, Pontotoc County Sheriff Leo Mask, and Keep MS Beautiful Vice-Chair and Mississippi Power Representative Cindy Duvall at the 2018 Sheriff's Summer Conference in Biloxi. The Hefty ® EnergyBag ™ Grant Program, led by Dow and Reynolds Consumer Products, collects previously hard-to-recycle plastics at curbside and converts them into valuable energy resources. This year, we are awarding a total of $100,000 in grants for organizations to establish Hefty ® EnergyBag ™ programs in their communities. The program is a significant step towards achieving positive long-term environmental and economic advantages, including alternative energy resources and fewer tons of plastics ending up in landfills. To learn more about the program, you can listen to a grant webinar recording here . 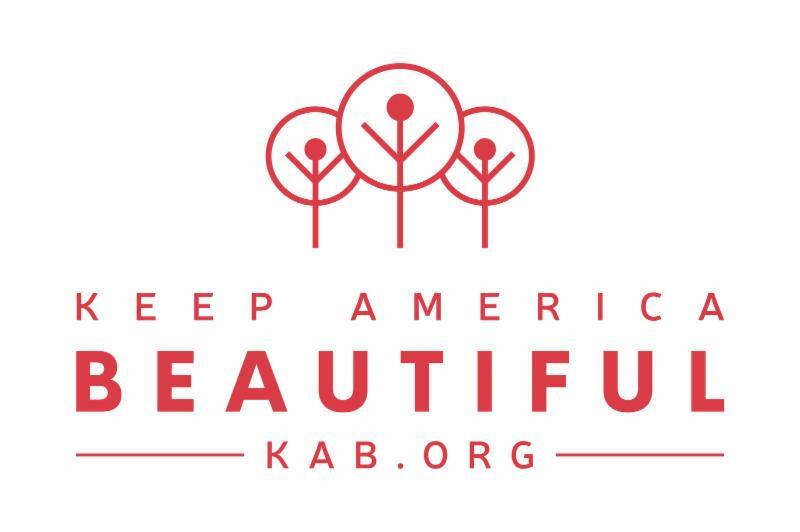 The Keep America Beautiful/UPS Community Tree & Recovery Tree Planting Grants. Community tree planting projects will address one or more of the following: reducing levels of carbon dioxide (CO2) and greenhouse gas emissions through strategic plantings; emphasizing the importance of native trees; or planting fruit trees to produce fruit for local consumption. Post-recovery tree planting projects will be given to affiliates whose communities have lost significant trees as a result of a natural disaster. These grants will focus on planting trees that have a greater likelihood of withstanding disasters ( e.g., roots hold soil and prevent erosion, lessen runoff to mitigate flooding). Projects will demonstrate long-term operational and financial sustainability. Priority will be given to affiliates that encourage and have an articulated plan for UPS employee engagement in tree planting projects. The mission of Keep Madison the City Beautiful is to promote, maintain and enhance the environmental quality of the city. Led by Affiliate Director, Tona Becker, they encourage neighborhoods and businesses to participate in litter prevention, waste management, recycling and beautification projects. Keep Madison the City Beautiful supports the Environmental Court which is held once a month and focuses on landscaping and up keep of residential homes. They coordinate a Recycle and Take Back Day twice a year and a Trash Bash cleanup once a year. A beautification sign is given every two months to a business and neighborhood entrance. Last year they planted over 100 Crepe Myrtle trees at the entrance to the city from Old Canton Road/Natchez Trace Parkway. Keep Madison the City Beautiful will be coordinating more projects in the coming year including landscaping the sign and chapel in Strawberry Patch Park. Through partnerships with churches, civil organizations, business, neighborhoods and city officials, Keep Madison the City Beautiful strives to maintain community volunteerism.